The northern Nigerian state of Kano is seeking polio vaccines from Asian countries to be used in a mass immunisation programme. The governor's spokesman Sule Yau Sule told the BBC that they had already ordered the vaccines and they expect the first batch to arrive soon. Mr Sule however says their boycott of the anti-polio campaign will not be lifted until the vaccines are tested. Half of the world's new polio cases originate in northern Nigeria. Kano suspended immunisations following reports by Muslim clerics that the vaccine was contaminated with an anti-fertility agent as part of a US plot to render Muslim women infertile. Mr Sule said they opted to seek the vaccine from Muslim states in the Asian continent where they had developed their own. "We shall also test the vaccines which we expect soon and if they are safe we will announce when the immunisation programme will begin," he said. 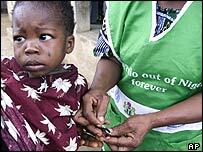 The northern states of Niger, Bauchi and Zamfara also pulled out from an anti-polio campaign that is targeting 60 million children. The World Health Organisation (WHO) has denied the claims by Muslim clerics opposed to the immunisation drive. Polio has already radiated out from northern Nigeria to infect people in at least six west and central African states.